Christine Kapadia comes from Gujarat in western India. Just like almost 90 per cent of the 60 million inhabitants of this state, she grew up as a Hindu, in a quite common Indian family. But what was rather unusual, was the lively interest she showed as a child in God. “When my father took me to school on his scooter I often turned to God, a God I didn’t know, not even his name, and to whom I told absolutely everything that moved me as a child,” recounted Christine. As a teenager, she sought God intensively. She looked into other religions. In retrospect, the now 34 year old says that as a young Hindu woman she knew little about Christianity at first (which is hardly surprising given in the Hindu-dominated state of Gujarat only nine per cent of the population are Muslims and the number of Christians is less than one per cent). So how did Christine’s parents react to their daughter’s great religious interest and her visits to places of worship of other faiths? “It didn’t worry them. They just let me get on with it,” Christine recalls. Her discovery of Christianity came more or less by chance. “When I was 15, I got to know Jesus in a cake shop,” she explained, and laughed. While making her regular purchases she became engaged in conversation with a saleswoman who was only a few years older than she and who was a Catholic Christian. 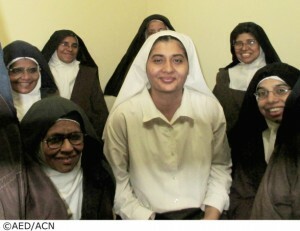 The young Hindu woman was fascinated with what she learned about Jesus Christ. Christine asked the saleswoman to take her to church. It was the start of a friendship and her gradual rapprochement with Christianity. Christine regularly took part in prayer meetings. When she was 17 she asked to be baptized, but her wish encountered resistance. Her parents rejected a conversion outright. “As long as I only went to church, they had no objection. But as soon as I wanted to get baptized there was suddenly a cold war at home,” Christine said. Her Catholic friends advised her to be patient: they said Christine should get baptized at the earliest when she reached the age of majority. Despite all the resistance, Christine stuck to what she wanted. In 2002 she was at last able to be baptized. Finally her parents respected her wishes. They had recognized that the new faith did not mean their daughter would move away from her home. On the contrary – Christine, who felt more and more drawn to a life in a religious order, took care of her parents and she even gave up her job in a bank to look after her mother when she developed cancer. A week before her death in 201, her mother was baptized as well. The tensions between father and daughter didn’t totally subside, especially since she expressed her ardent wish to become a Carmelite nun. But once again Christine’s patience paid off: she has now belonged to a community of a total of ten, discalced Carmelites (OCD), for the last six months.